Geoff organised and supplied the aircraft etc. Below are a few words from Geoff about the game. Firstly I wanted to thank all the guys that turned up, I wasn't quite sure how the game would be received, as most comments at the end of the day were very favourable, so I was pleased with that. 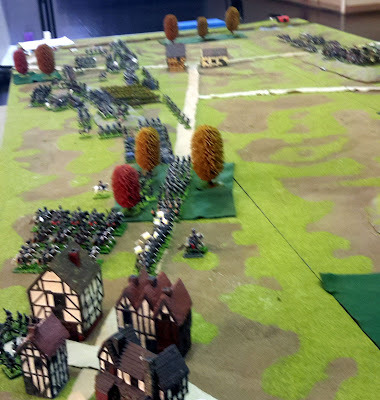 The playing mats ( except for one of the clubs wine sodden table-cloth, [used mainly in many of our Napoleonic battles] ) were from Hotz Artworks ( Canada), thankyou Eric Hotz. The aircraft used were a combination of Wings Of war , Skytrex (U.K.) and Reviresco (USA),the wings of war aircraft come prepainted and sit on the clear plastic stands, the 2 other manufacturers are of bare metal and require being put together and painting , the metal stands are supplied from Corseng Engineering ( USA). The game itself is a product of Andrea Angiolino and Pier Giogio Paglia, in which each aircraft has it's own flight charachteristics depicted on a flight card and the aircraft is moved according to the card.The base of the aircraft stand displays 2 alpha letters and 1 numeric, the first 2 letters indicate the flight card to be used and the second shows the type of damage it inflicts, whilst the numeric shows the amount of damage a plane can suffer before it is destroyed. Our September meeting consisted of aircraft that were in service from mid 1917 to early 1918, most of these aircraft were still in service until the end of the war in November 1918, whilst newer aircraft were introduced after April 1918. As it happened, unfortunately for the guys flying on the German side, it was more than a disaster, the Camels blasted the Fokker DR1's out of the sky, with 2 exceptions, that of the Red Barron (Thoran) and the red and white Fokker (Jasta 18) (Peter). The Pfalz and Albatros did not fare any better. With that in mind, I'm thinking that for the December meeting, earlier aircraft will be used ( early 1917) and our first game should open with an advantage for the Germans having Albatros D3's and Pfalz D3's against Sopwith Triplanes and Nieuport 17's both of the Allied planes can only inflict "B" damage whilst the central powers inflict "A" damage. "B" damage is 0 to 3, whilst "A" damage is 0 to 5. Unfair!!! Well the allies and Central will get to have a go for the second game which will include Sopwith Snipes and Dolphins for the Allies and Fokker D7's and D8's, as well as Siemens Schuckerts D4 for the Germans. Thanks once again, hope everyone did enjoy the game, am working on plans for a campaign that will include 2 seaters and heavy bombers.